A wonderful dish in the autumn and winter if you live in a region where partridge is available in season. 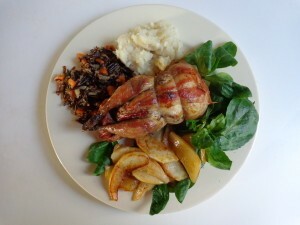 If not, there are online food sites in many countries where you can order partridge and other game birds. 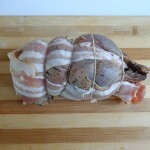 Or you can substitute Cornish game hens and increase the roasting time to 45 minutes total. Check to see whether the birds are done by inserting a toothpick. If the juice runs pink, roast for an additional 5-10 minutes. If the juice runs clear, the birds are done. 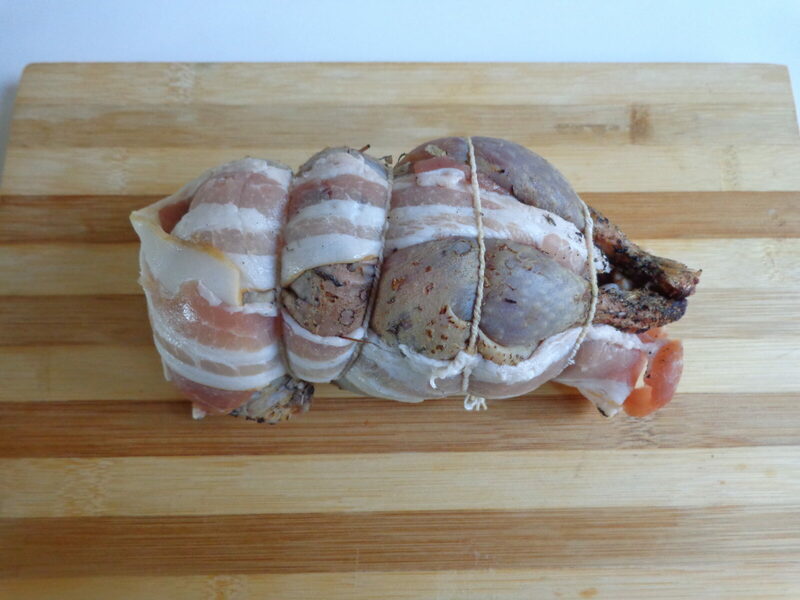 If possible, have your butcher bard the birds with strips of bacon, as shown in the photo. If not, follow the instructions below. Serve the birds with autumn vegetables that you have prepared in advance, for example wild rice and puréed celeriac or sweet potatoes with herbs. You will need a roasting tin that can be put over a flame. I find that an aluminum cake pan works quite well. Begin by barding the birds. Place a strip of bacon on top and attach with a toothpick at each end. Now place a strip along each side and attach in the same way. An alternative is to tie the strips with cooking string, but toothpicks are easier. Insert the thyme branch in the cavity. Preheat the oven to gas mark 7 (425 F, 220 C). Brush the bottom of a roasting tin with half of the olive oil. Brush the rest over the birds. When the oven is hot, put the birds in to roast. Turn down the heat to gas mark 6 (400 F, 200 C). After 10 minutes, remove the birds, daub with 1 tbsp. butter, and put back in to roast. Repeat after another 10 minutes. Then roast for 15 minutes more. Total roasting time is 35 minutes. While the birds are roasting, prepare the pears. Cut in quarters, remove the peels and cores, and slice each quarter into 4 parts lengthwise to make 16 slices per pear. Heat the remaining 1 tbsp. butter in a frying pan. When the butter is hot, add the pear slices and sauté for about 3 minutes per side, until they are golden brown. Turn off the heat but leave the pears in the pan for reheating just before serving. Place the greens on the plates and heat up the other vegetables so they will be ready when the partridges come out of the oven. When the birds are nearly done, reheat the pears over a low flame. Turn the oven down to low, remove the birds and set them on a board to rest. Remove the toothpicks or string. Season with salt and pepper. Place the birds in a clean pan and put them back in the oven to keep warm while you are making the sauce. Add the water to the tin in which you roasted the partridges, place the tin over a flame and scrape the bottom with a wooden spatula to incorporate the cracklings into a smooth sauce. Place the birds on plates, place the pears on the greens and surround with the vegetables. Spoon the warm sauce over the birds. Serve with a fine red wine. Serves 2.